Mercury stations retrograde on February 6, 2014 at 3º20′ conjunct Neptune in Pisces (Neptune will be at 4°25′) at 1:43 pm PST. Mercury returns to Aquarius on February 12 having been between zero and four degrees of Pisces from January 31 – February 11 (take note people with planets between 0 – 4 degrees of Mutable signs). Inferior conjunction of Mercury retrograde and the Sun on February 15, 2014 at 27º4′ of Aquarius. This inferior conjunction will be square Saturn in Scorpio and in trine to Mars in Libra. Full Moon the day before the Inferior Conjunction at 26°13′ of Aquarius and Leo. Mercury stations direct on February 28, 2014 at 18º9′ of Aquarius. Mercury leaves its retrograde shadow zone on the Equinox of March 20, and will be exactly conjunct Neptune at 6°02′ of Pisces on March 22, 2014. “The Water Nymph” painting above is by an artist, John Collier, with an interesting connection to this astrological moment- he was born in 1850, the last time Neptune was in Pisces at its current area of Pisces, and he also was born with an Aquarius Mercury in the same place as the upcoming inferior conjunction of Mercury retrograde and the Sun. 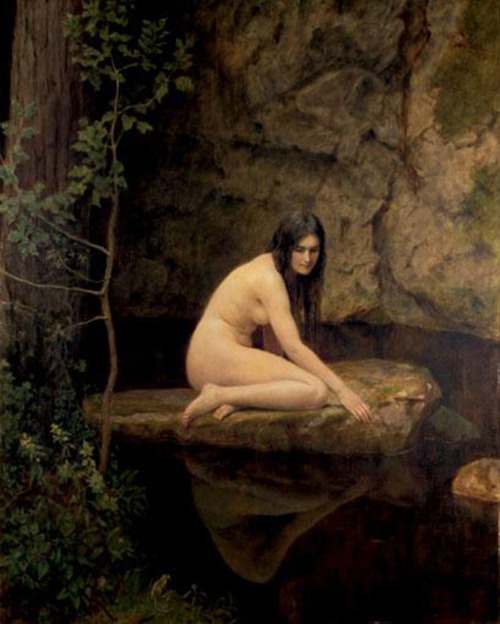 To me, the “nymph” in the image is completely absorbed into nature, her natural surroundings, the Soul of the world, opening her to a direct connection with Spirit. While this connects with Mercury conjunct Neptune in Pisces, so does her gazing at her reflection in the water connect with a Mercury retrograde cycle beginning in Pisces. During Mercury retrograde we have the opportunity to reflect upon our perceptions, imaginings, and just exactly where are thoughts are coming from. This can be an internal experience, but we will most likely get a sense of how our inner dynamics are operating through our relationship to the outer world and interactions with others, including conflicts. There are astrological signs we will experience challenges in the external world at this time, as calming as Mercury stationing retrograde conjunct Neptune in Pisces may sound. This is because Mercury stationing retrograde happens at a first quarter Moon of Taurus at 19 degrees that is especially intense, as the Aquarius Sun and Taurus Moon forms a t-square with Saturn in Scorpio at 23 degrees. This is happening simultaneous to the other big t-square of Cancer Jupiter opposite Venus and Pluto in Capricorn, all in square to Uranus in Aries. Beginning on February 6, we will be facing these challenges with Mercury descended to the underworld, acting as the Psychopomp guide of our souls. The Sabian symbols as interpreted by Dane Rudhyar give us a clear warning for this upcoming Mercury retrograde- desires and thoughts not aligned with Soul and Spirit, or Source (or Gods, Goddesses, God, what have you) will not only crash on a wave of disillusionment but may bring significant karmic repercussions to not just ourselves but the wider collective of our world. The Sabian symbol for Mercury stationing retrograde is “heavy car traffic on a narrow isthmus linking two seashore resorts,” while the symbol for Neptune at this time is “a church bazaar.” Huh? Well, Rudhyar explains the isthmus traffic jam as a relic of the fact that the Sabian symbol transmissions went down in the San Diego, California area where such structures exist. Since traffic jams are an astrological stereotype connected to Mercury retrograde periods, this may make sense, but the meaning of this symbol is much deeper. Part of the meaning is a “traffic jam” of thoughts and information, as anyone who has been on social media is familiar with. Thoughts have always been viral, with any thought carrying the potential to become swept up into the whirlwind of the collective zeitgeist and infecting multitudes, with many not even aware of how their previous thoughts have been shifted by the new viral thought pattern. However, social media and things like facebook have made this phenomenon more extreme- facebook in particular being problematic as its feedback mechanism circulates posts from people you have “liked,” so the tendency is a feedback loop of people with similar perspectives or interests. Rudhyar notes in the symbol that the sea surrounding the isthmus of traffic “stresses the collective nature of social experiences and of what may appear to be ‘individual’ achievements” (p. 271). Rudhyar also highlights words such as “commerce and social interactions in a new form,” and “the need to establish unceasing dynamic relationships between all aspects and functions of the social life” (p. 270-1). There is a danger in establishing new forms of interactions and relationships if we are not discerning, however, as the “church bazaar” symbol for Neptune connects with the social fabric of religions, the Church, or any group coming together for a spiritual purpose, from the New Age to the old. The Neptune/Mercury/Pisces danger is that these social groups create a code of being that “justifies human behavior by blessing it with a divine Revelation of what is good and valuable” (Rudhyar, p. 271). Spiritual doctrine guiding “right human relations” is valuable, however, there is also a Neptune trap of individuals justifying or rationalizing their behavior because of a belief it is of divine origin, or what God wants them to do, when in actuality it is more about their own selfish desire at the bottom line. This is an important aspect of the Neptune archetype developed by Jeff Green in his soul-focused Evolutionary Astrology: that while Neptune can help us spiritualize our life and connect with a timeless sense of ultimate meaning, we can also project delusional beliefs concerning ultimate meaning and can deceive ourselves and others that our selfish, separating desires are connected to Divine Will. I see this connecting to the Sabian symbol for where Mercury is stationing direct at 19 Aquarius, “a forest fire is being subdued by the use of water, chemicals, and sheer muscular energy.” As Rudhyar analyzed, forest fires can often be caused by humans and their modern inventions of technology, the tools of commerce and communication referenced in the Sabian symbol for where Mercury stationed retrograde. And yet, at the same time the dynamic capacity humans have for communication and ingenuity can help us recover from disasters and come to the aid of life in danger of eradication. Along these lines, the dynamic modes of communication indicated by the stationing symbol could also relate to us coming into contact with like-minded people, groups of people, on a global level, using technology to connect with others across great distances. However, as Rudhyar noted in his analysis, the stationing degree symbol for Mercury indicates we will have our “strength, ingenuity or emotional stability” tested at this time, and that with faith we will have to draw from every resource available- “emotional, mental, physical” (p. 261). Thus, whatever collective calamities will be arising that many of us are partially responsible for, we can use this Mercury retrograde cycle to re-formulate ourselves and prepare for the challenging times ahead, connecting with others who will be mutually benefit supports with us. The Sabian symbol for the inferior conjunction of Mercury and the Sun is aligned with this idea: “a tree felled and sawed to ensure a supply of wood for the winter.” I feel this line of analysis from Rudhyar is very pertinent for now: “In meeting the hardships inherent in an existence close to nature, strength, efficiency and intelligence are needed, but they are incorporated in a life in which every act can be part of a harmonic and beautiful ritual permeated with deep significance” (p. 266). The more we can use this Mercury retrograde to go within, to question and discern our thoughts and perceptions and their source, the better. The more we can sense and feel the soul of everything, everyone, everywhere we go in our daily experiences, the more we can connect with the correct current of Neptune for us to float down during this retrograde. Neptune transits can be confusing, and so a Mercury retrograde cycle initiated by Neptune in Pisces sounds like perhaps the most disorienting of all: yet while these Sabian symbols and the deeper meaning of the astrology do suggest we need to be discerning in navigating through a Pisces fog, there is at the same time a tremendous inner resource available for us to cultivate with work that will help us persevere through the challenging times ahead on the horizon. Mercury is traditionally not seen as operating smoothly in Pisces, since Pisces is the opposite sign of Virgo that is ruled by Mercury. While Virgo embodies incredible tools and techniques for smooth, clear, and effective communication, Pisces still carries its own unique gifts into Mercury. However, keeping the “viral” idea of thoughts in mind is important for Pisces, a sign that can be overly sensitive to its environment (and why Pisces people usually sense on their own when they need to take some time to themselves away from the thoughts of others). Spending time going within is key now- reflecting, meditating, whatever will help us re-center and realize whether or not our desires are coming from an authentic affinity for soul and spirit or if instead they are being manipulated by outside sources or overly selfish desires. Mercury in Pisces is more intuitive and poetic than it is in other signs, perhaps open to misinterpretation but capable of expressing incredible emotion, perceiving and communicating the essence of the soul embedded in every aspect of our environment. Looking at a list of people with Mercury in Pisces is a look at genius in a variety of fields: Dane Rudhyar, Rudolph Steiner, Charles Darwin, Copernicus, Gallileo, Bach, Houdini, James Joyce, Stephane Mallarme, Charles Baudelaire, Milan Kundera, Roberto Assagioli, Kurt Cobain, Nina Simone, Billie Holiday, Aretha Franklin, Harry Belafonte, Auguste Renoir, and Piet Mondrian. Creating a structure or form for Mercury in Pisces is absolutely vital, however, so that there is a way to communicate the insights a Pisces Mercury can perceive in a form other people can understand. This Mercury retrograde will be an opportune time to create a daily practice of some form where we can process our experience. This sort of practice can be even more beneficial given that Venus has recently stationed direct and is now moving forward back across her retrograde shadow zone. In fact, on the same day of Mercury’s Inferior Conjunction with the Sun- February 15, 2014- Venus will be shining at her peak level of brightness as the Morning Star. The Botticelli painting above, commonly called “La Primavera” or “Allegory of Spring,” contains two pivotal archetypal figures of this astrological time, Mercury on the far left pointing toward the celestial heavens, and Venus honored in the center. 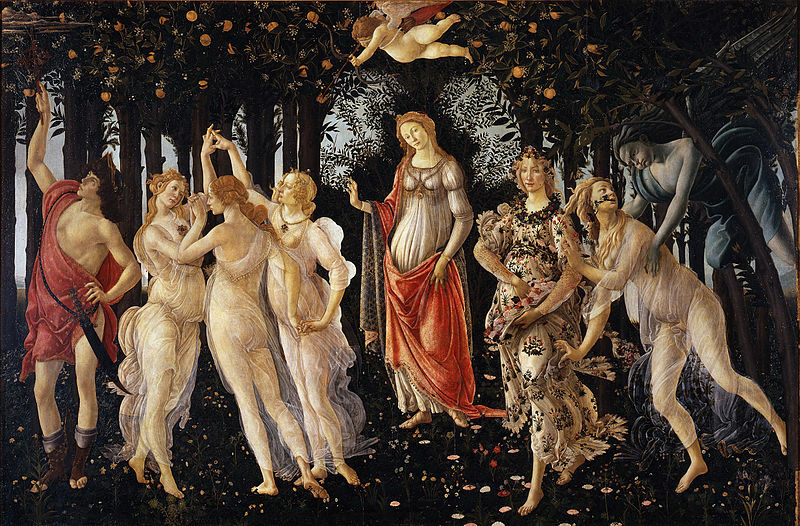 The Botticelli painting above is also fitting for this Mercury retrograde because Mercury will not leave its retrograde shadow zone until the Northern Hemisphere’s Spring Equinox of March 20, 2014 (the Autumn Equinox in the Southern Hemisphere- but Botticelli lived in the Northern Hemisphere). In his extraordinary book The Planets Within: the Astrological Psychology of Marsilio Ficino, Thomas Moore analyzed this work through the soul-focused perspective of Marsilio Ficino, a Renaissance astrologer and philosopher who had an enormous influence over Bottitcelli. Moore wrote that Mercury “looks to the clouds, not because he has no place in the scene or is not interested in life’s graces, but because it is his office and function to see behind the facade of things, to find the significance and value which lay hidden in the folds of ordinary existence” (p. 142). 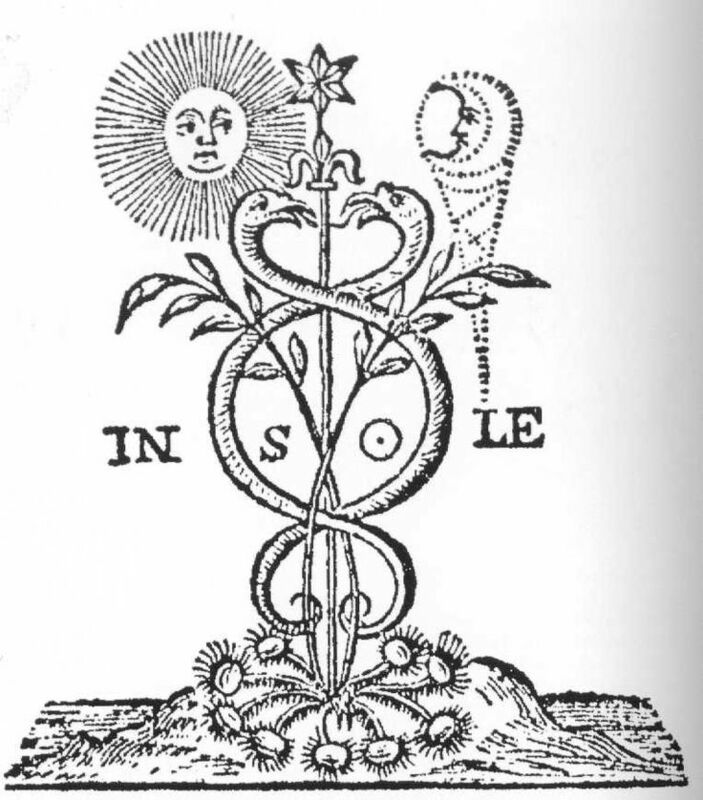 Moore also elaborated at depth on how this image embodies the perspective of Ficino that Venus is both an earthly and celestial goddess, concluding that “Venus leads the soul into the body and through the body to spirit. From spirit, to body, back to spirit” (p. 142). Ficino saw spirit as being like the “fire of the stars,” and intrinsically connected to soul, emphasizing the importance of imagination in finding our path and calling in the world (p. 49). Moore wrote that Ficino valued imagination because it “allows of a vision that penetrates the surface of things and grasps those factors that have significance for the psyche” (p. 50). With Mercury retrograde descended to the underworld at this time, our imagination will be an important skill to use in our daily life because Mercury in this soul-guide role will open us to perceiving information in dreams, omens, synchronicity, and other signs we will pass on a daily basis. Whoever discovers his own genius through the means we have stated will thus find his own natural work, and at the same time he will find his own star and daimon. Following these beginnings he will do well and live happily. Otherwise, he will experience misfortune and feel the enmity of heaven. Mercury retrograde in Pisces conjunct Neptune at this time, with Venus slowly moving direct conjunct Pluto in Capricorn, are two celestial configurations to draw from in opening our perception to the Soul of our surroundings and a connection with Spirit. Venus in particular can help us get into touch with our soul through our body and physical surroundings at this time, as she is still close to Pluto after her long retrograde journey. However, both being personal planets that are highly charged at the moment, they are also both pivotal archetypes to utilize at this time for deep internal reflection and gaining a deeper awareness for what is going on in our inner relationship with our Self. Indeed, Venus is opposite Jupiter in Cancer at this time, and Jupiter is the traditional ruler of Pisces where Mercury is stationing retrograde. Jupiter in Cancer is also retrograde in a Water sign like Mercury, so going into our emotions at this time can be very fruitful and revealing. We will want a practice of some sort to access this information- it can be contemplative like taking some time to simply breathe or meditate, or it can be more active like playing music, creating art, or writing. Venus is a potent ingredient to this Mercury retrograde not just because she is currently conjunct Pluto and opposite Jupiter, however, but also because at the beginning of the Mercury retrograde she is ruling the transiting South Node in Taurus. Significantly, in the days leading up to Mercury stationing direct, the lunar nodes will switch signs with the South Node becoming Aries, and the North Node becoming Libra. As a result, when Mercury stations direct Venus will have become the ruler of the transiting North Node of the Moon. This is another sign of an important bridge at this time between our own individual experience with the wider collective experience- take the responsibility to create the life you want to live, instead of wasting energy through complaining about what other people are doing. The inferior conjunction of Mercury retrograde and the Sun will be at 28 degrees of Aquarius on February 15, but will still carry overtones from the retrograde initiation of Mercury conjunct Neptune in Pisces. 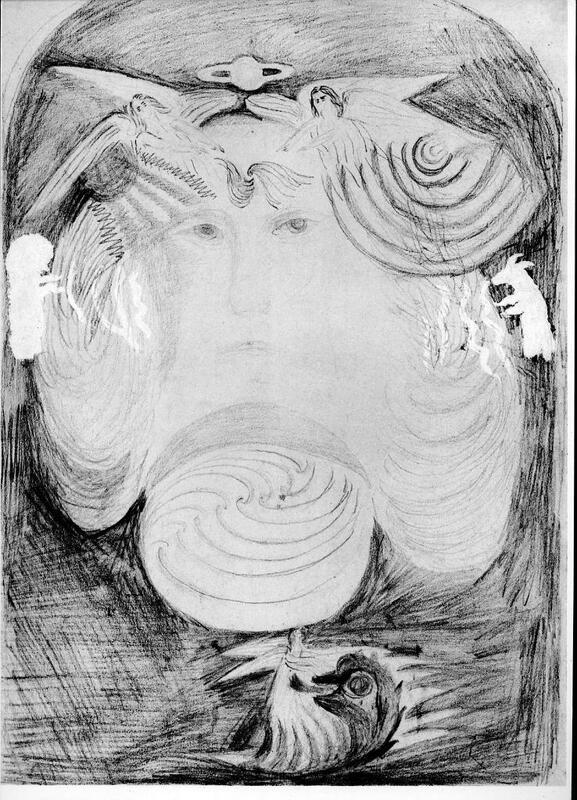 The above pencil sketch was drawn by astrologer and philosopher Rudolph Steiner, who was born with Mercury conjunct Neptune in Pisces and is a good example of the sort of limitless perception a Pisces Mercury-Neptune combination is capable of embodying. Relevant to the meaning of Mercury retrograde, Steiner once said, “Thinking … is no more and no less an organ of perception than the eye or ear. Just as the eye perceives colours and the ear sounds, so thinking perceives ideas.” He also wrote Mystery plays with titles fitting to this Mercury retrograde: The Portal of Initiation, The Souls’ Probation, The Guardian of the Threshold and The Soul’s Awakening. The upcoming inferior conjunction of Mercury and the Sun will be in Aquarius, however, a sign with a very different energy than Pisces. Aquarius is the water bearer, but the water borne by Aquarius is illuminating and purifying, more of a cleansing energy than the fertile waters of Pisces that can get us rather muddy. The inferior conjunction is like the New Moon for Mercury and the Sun, a new point of conception for our Mercury function and archetype in the world. In contrast, the time leading up to this inferior conjunction, from February 6-14, will be more like a Balsamic Moon for Mercury, a time of releasing old thought forms, patterns, and embedded concepts in preparation for the new Aquarius vision to come after February 15. We can feel confused at this time if we are insisting on being overly logical or rational, because the more “irrational” or unconscious mode of perception will be open to a greater extent, with information arising around us in dreams, signs, and symbols. The inferior conjunction happening in Aquarius is perfect for a new vision, and the fact Mercury will re-enter Aquarius a few days before will help us objectify and detach from old thought forms in order to clear them for good. Saturn is the traditional ruler of Aquarius, and Saturn in Scorpio will be very significant in this time period as the inferior conjunction will be in square to Saturn in Scorpio, and when Mercury finally stations direct on February 28, Saturn will be stationing to turn retrograde a few days later on March 3. In addition, during the Mercury retrograde there will be a lunar occultation of Saturn in Scorpio on February 21. Saturn has correlations in astrology to the alchemical process in association to the lead or base of conscisousness, a darkness that paradoxically contains its own light and gold. This is the Jungian idea that by going into our darkness and shadow, we can alchemize and heat up our inner spark of gold- in this case events associated with transiting Saturn in Scorpio. Aquarius will lend it’s penetrating insight to this inferior conjunction of Mercury as well as Mercury’s eventual stationing direct at the end of February, a perceptual awareness that can detach from emotional compulsions and can facilitate us liberating ourselves from habitual patterns of thought that have been limiting us. We can use Aquarian insight to help us structure our own alchemical vessel within, mindful of the concept in verse 10 of the Tao Te Ching in which Lao Tzu states that “Clay is moulded to form a vessel, but it is the emptiness inside that gives the vessel its use.” If you prefer to use Uranus as the ruler of Aquarius like most modern astrologers, then you don’t need to look farther than Uranus in Aries being in a t-square to Cancer Jupiter and Capricorn Pluto/Venus at this time for the star fire to heat your alchemical vessel. No matter what your rulership perspective is, however, there is more than enough star fire going around in various transits to heat your experiences into greater clarification. While a square from Saturn in Scorpio to the Sun and Mercury in Aquarius may sound intense, there is also a tradition that there is sympathy in the square between Aquarius and Scorpio because they “see” one another as a result of being signs of equal power. I recently watched an excellent webinar by Seattle astrologer Kate Petty called “Reflections Across the Cardinal Axis” that is available from Kepler College in which she very clearly illustrated this ancient concept if anyone is interested in learning more about this (basically it has to do with the fact that Scorpio and Aquarius are equi-distant signs from the Solstice, or Capricorn/Cancer axis). In addition, since Saturn is the traditional ruler of Aquarius there is an affinity here, and with Saturn being in Scorpio we can add in a soul-focus to this affinity that connects to the humanitarianism of Aquarius. There will also be a trine from Mars in Libra to the inferior conjunction in Aquarius of Mercury and the Sun, which will give us an opportunity to link our new vision into social justice concerns and issues, or into the development of new relationships. Mars will be stationing retrograde in Libra immediately following Mercury stationing direct in Aquarius, and so this trine between Mars and the Mercury inferior conjunction is a powerful omen of an auspicious link between the two cycles to take advantage of for an increased self-awareness that will ultimately help us face oppressive conditions and other issues related to social justice in the collective global community. Saturn in Scorpio is a karmic placement not unlike the deities Kali and Mahakala, and Saturn will suffer no fools at this time. As a result, if we are operating from some delusional beliefs or selfish desires we will no doubt have something loudly and boldly thrown in our face, so to speak, or experience profound disillusionment from within. If our imagination becomes activated, we will no doubt face tests of whether we are perceiving true or fabricated imaginal thought; likewise, if we feel a spiritualization occurring we will face tests of whether we are perceiving a true or fabricated connection to spirit. Avoid clinging to denial out of defensiveness at this time and be open to questioning any beliefs or thoughts you have been operating from. As Scorpio and Aquarius are both fixed signs, if we are unwilling to shift or flow with the current of our life we will add fuel to the fire of conflict arising around us. Prior to the inferior conjunction of Mercury and the Sun we will have a huge build up of energy with a Leo Full Moon occurring on the previous day, in square to Saturn in Scorpio. If you haven’t been paying attention, that means Feburuary 14, the traditional “Valentine’s Day” of romantic fantasy and illusion in our culture. Perfect, right. Remember that as we approach this build of energy that Mercury is in the underworld guiding our soul experiences and so we will want to attune to and align with the signs arising around us indicating the path forward. 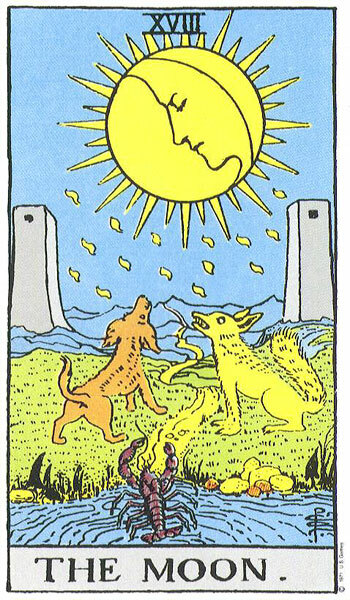 This is a powerful lunar cycle: the New Moon began the day before Venus stationed direct conjunct Pluto and opposite Jupiter, and then the Full Moon happens the day before the inferior conjunction of Mercury and the Sun, all in square to Saturn in Scorpio. I feel having some strong Leo lunar energy at this time will be a true blessing of the goddess, as we will be saturated so much in Aquarius and Scorpio energy. This will be an important time for self-love and to pamper yourself like you would a lover; if you are lucky enough to have a true lover in your life, this can of course be a mutual experience. Just don’t get caught up in the blown-up romantic expectations of our cultural Valentine’s Day driven by selfish corporations who want you to purchase their ethically questionable chocolate. If we have been behaving in an overly selfish manner, or projecting our opinions and desires in an unbalanced way into our environment in order to over-compensate for inner wounding or lack of true confidence, the Leo Full Moon may illuminate these issues strongly through the square from Saturn in Scorpio. Finally, I briefly want to comment upon how a 7th Harmonic could possibly be affecting your natal chart at this time. 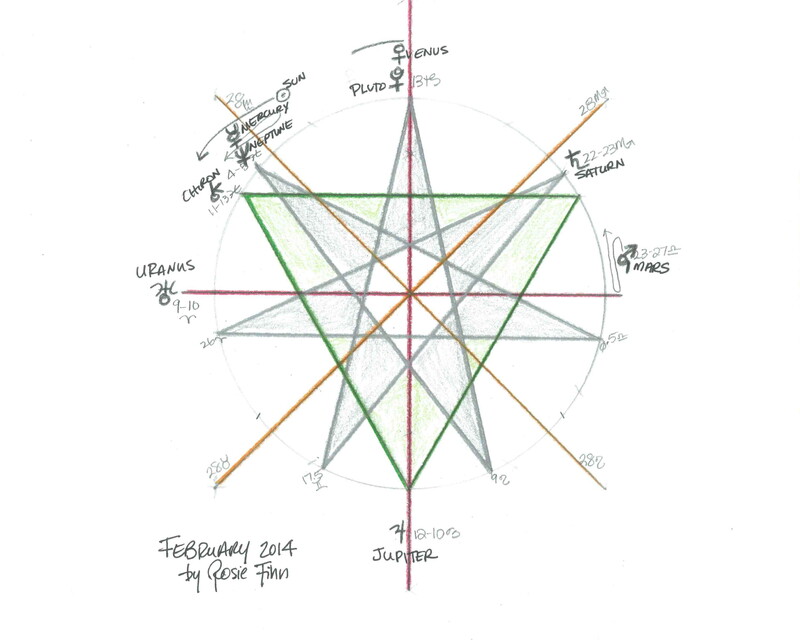 The above diagram was drawn by Olympia astrologer Rosie Finn, who has taught my information concerning the 7th Harmonic. The seven pointed star you can see above is activated in February by Mercury stationing with Neptune in Pisces, Venus stationing with Pluto in Capricorn, and Saturn in Scorpio- the other missing points are 26 Aries, 17.5 Gemini, 9 Leo, and 0.5 Libra. You can look for transits to these points, or perhaps they are active in your natal chart through an aspect of some manner. The 7th Harmonic is a strange harmonic, made up of septiles (51.5 degrees), bi-septiles (103 degrees), and tri-septiles (154.5 degrees). I’ve learned from Rosie that these septiles can involve magical creativity and vision, a mystical sense of information descending from another realm, or a transfiguration. They have an energy similar to the dissolving of boundaries and transcendence of “normal” reality that we often associate with Neptune and a Mercury retrograde period initiated by a conjunction of Mercury and Neptune in Pisces. The 7th Harmonic can be highly creative and spiritual, can appear weirdly anomalous and difficult to occur naturally. In a class one time Rosie gave Beethoven as an example of someone with a strong 7th Harmonic who created highly spiritual art yet also had to persist through the pain and suffering of being deaf (in contrast to Mozart who had a strong 5th Harmonic). The bi-septile and tri-septile aspects of the 7th Harmonic stress the importance of integrating creativity into our purpose and process and making the necessary adjustments to manifest the inner revelations of this process and purpose back out into the external world. As the 7th Harmonic is a strange one, this isn’t exactly easily done. However, anyone having experiences resonating with this description will be able to draw upon this Mercury retrograde process at this time to make the inner adjustments necessary to ultimately express whatever epiphany is being experienced within. Rudhyar, Dane. (1973). An Astrological Mandala: the cycle of transformations and its 360 symbolic phases. Vintage. Thank-you! I’ve been trying to understand septiles as they are a bit nebulous. Interesting analogy between Beethoven and Mozart, although they both channelled incredible music from the cosmos. Robert Wilkinson at aquariuspapers.com has some fascinating info. on septile series which he has termed “The Grand Irrationality”! I just had a thought that perhaps the astrological climate that we are moving into is more welcoming now of the creative, spiritual potential of the septile energies, than it has been for sometime? IDK! I love that John Collier painting. She reminds me of me little while ago now. Still, show me a little swimming hole and I’m in there! Despite being a fire sign. I also love the beach. This article reminds me of an Aquarian, Mercury Pisces friend of mine who has been living on a catamaran which he built with a builder for 25 years. He moors it up very quiet creeks and every year sails on the migrating whale watching pilgrimage. I call him a forest gnome as he wanders bare foot through the rainforests, knowing every individual tree for miles around working on his Gaia healing passion for the world. Thank you for your comment. I have Blue Herons around me where I live and I always take their appearance before me into account, they have appeared like an oracle at times to me. I cannot call myself an expert on Septiles, although I do have a strong 7th Harmonic in my own chart so I am trying to explore it more as it is something I have to work with. I think you are right about this Mercury retrograde invoking a “Grand Irrationality.” Your friend does sound like someone who embodies the sort of Aquarius Sun, Pisces Mercury interpretation I wrote about. Reblogged this on Love Earth Visionary. You can add Edgar Cayce to your splendid list of brilliant minds with Mercury in Pisces. The vessel you talk about is like the Holy Grail they all carried for humanity. On a personal note, a lot of the placements that you mentioned touch my natal chart but I was especially happy to see that my natal Sun will be involved in the seventh harmonic. That brings a lot of hope for creativity. I really admire your skill to bring together so many seemingly contradictory astrological approaches and techniques and show us how they just paint various faces of universal truth. Edgar Cayce- how could I have left him out! He does fit well with that list I included. Also thank you for including Rudhyar’s writing on Saturn in Scorpio. If I had known he wrote that, I would have referenced it in this post. Interesting to me I appear to be on a similar wavelength with him on that. Yes, the lunar occultation of Saturn is interesting to ponder- I really like what you included from Rudhyar about the meaning of Saturn in Scorpio and think that theme could be resonant with this lunar occultation coming up. Gray a lovely presentation as usual. By the way the unfolding of that conjunction of the asteroid Hestia has been most amazing, as well as astrologically synchronous related to meaning. How delightful that Venus in her underworld journey has coincided with magic for you. It is always nice validation to hear that you like my writing given your deep work with psyche and soul. Thank you. Hey Gray! liked your post on the Mercury Rx in Pisces. Beautiful and deep as usual .. it’s interesting to me that you view Mercury as deep archetype in psychological terms. That’s inspiring to me in my work about the Mercury thing because it always is so elusive to me, as if it were only an appearance. Thanks ! Wonderful to hear from you here. I feel honored you appreciate my writing on Mercury. You have also been an inspiration to me with your deep work into astrology and the Mercury archetype. It does appear from my wordpress “stats” that the “lords of google” are directing traffic to me. I guess better to be a friend than an enemy in terms of Internet navigation and the people controlling the circulation of information. Seems equally possible in today’s age for search engines to prevent people from finding your work if they chose to do so. I am happy you found this article to read. I would like to know what you think, as reading it now you would have already experienced what this was intended to be a preview toward. Also- if you have not noticed my last post on Dionysus I would really like to know what you think of it. Including the fact that you have the Dionysus asteroid closely conjunct your Sun in Virgo, and within ten degrees of your Jupiter. I did not notice this before when talking to you about your chart, but it seems fitting.